Raise your hand if you find recipes daunting. Yep, me too. I mean, when it comes to baking, recipes are my bible. I cling to every word, obey even the most menial of instructions, weigh ingredients obsessively, time the exact number of seconds needed to whisk eggs and sugar. Baking is like cooking blind – you have no idea what the dish will actually become. You have runny, sticky dough and have to pray that it will turn into a dense pancake or fluffy bread. But cooking, man, I don’t know. I can’t follow recipes. I stray. While I take comfort in religiously obeying my cake recipes, cooking ones always seem so… long. Just too long. It may be the never-ending lists of ingredients, the confusing measurements (a quarter of a ginger root, chopped. Three whispers of crushed garlic), or maybe just the fact that I can see and taste the food transforming in front of my eyes, which gives me false sense of control. I don’t know. So while I observe the wonderfully shot, polished recipes of Lady and and Pups, frowning at a list of ingredients that I wouldn’t even know where to find, wondering if I do have time to marinate my chicken for six hours while the bread is proofing and I knead my hand smashed noodles – also do I need an ice cream bucket in my life? – I just want to make something that involves a few ingredients and a few steps. I’ll just bookmark that turmeric butter chicken recipe and never click on it again. So this is a take on Pane Frattau, a Sardinian dish which I first tried in a little cafe in Ealing (figures). 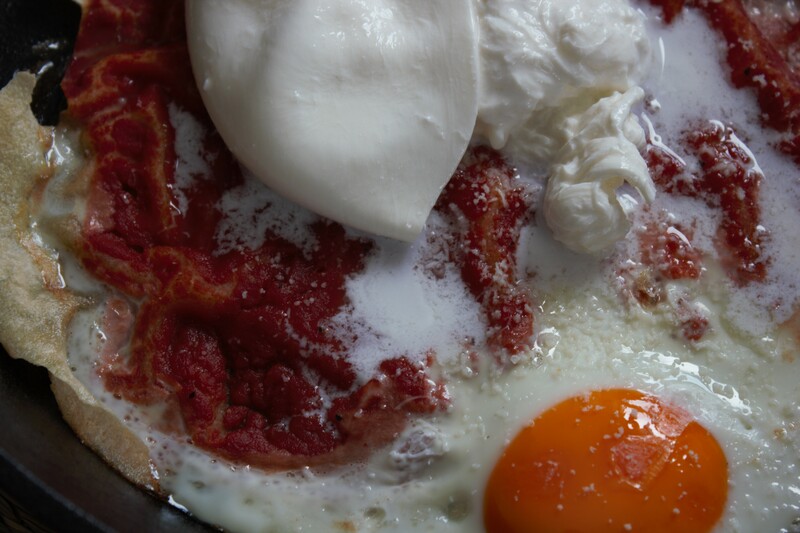 It’s layers of Carasau bread, softened, with tomato sauce and a poached egg. Well, in my case, fried, because I don’t understand how anyone could choose poached over fried. It’s beautifully simple, if a little lazy, but somehow the bright passata and the sticky egg old on soft, chewy bread just make for a perfect meal. I know, I speak about obscure ingredients and then I make something with Carasau bread? I know, I know. But you can find this moreish, thin crispy bread in any M&S and some larger supermarkets. Pour some hot water onto each leaf of bread and let it soak for a a coupe of minutes, until soft. 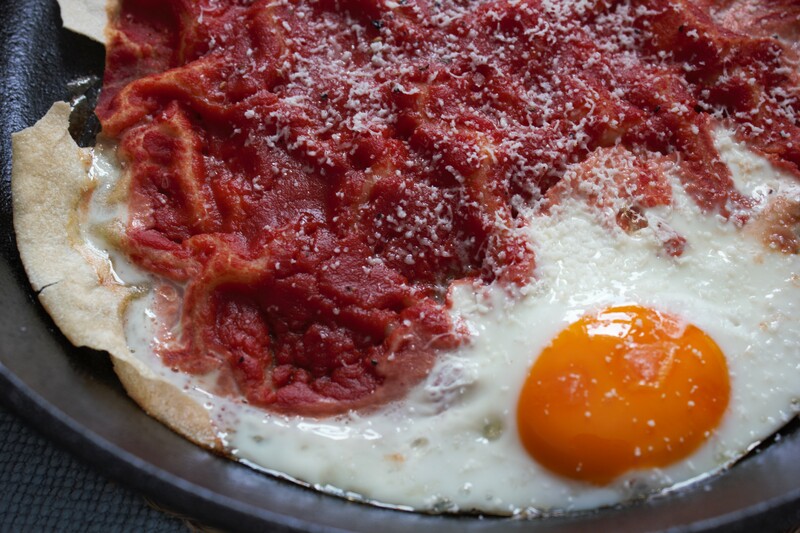 Move to a skillet or any oven-safe tray, spoon over some tomato passata, add a little olive oil, salt and pepper. Crack the eggs into the dish and bake in the over at 180° for 10-15 minutes, until the eggs are done. Sprinkle with pecorino and, if you have spare burrata, throw that in there too (why not?). Burrata makes everything better.